Multi-span pre-tensioned pre-stressed concrete beam (PPCB) bridges made continuous usually experience a negative live load moment region over the intermediate supports. Conventional thinking dictates that sufficient reinforcement must be provided in this region to satisfy the strength and serviceability requirements associated with the tensile stresses in the deck. The American Association of State Highway and Transportation Officials (AASHTO) Load and Resistance Factor Design (LRFD) Bridge Design Specifications recommend the negative moment reinforcement (b2 reinforcement) be extended beyond the inflection point. However, based upon satisfactory previous performance and judgment, the Iowa Department of Transportation (DOT) Office of Bridges and Structures (OBS) currently terminates b2 reinforcement at 1/8 of the span length. 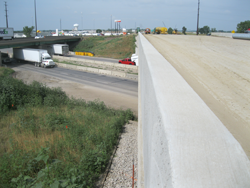 Although the Iowa DOT policy results in approximately 50% shorter b2 reinforcement than the AASHTO LRFD specifications, the Iowa DOT has not experienced any significant deck cracking over the intermediate supports. The primary objective of this project was to investigate the Iowa DOT OBS policy regarding the required amount of b2 reinforcement to provide the continuity over bridge decks. Other parameters, such as termination length, termination pattern, and effects of the secondary moments, were also studied. The parametric study results show that an increased area of the b2 reinforcement slightly reduces the strain over the pier, whereas an increased length and staggered reinforcement pattern slightly reduce the strains of the deck at 1/8 of the span length. Finite element modeling results suggest that the transverse field cracks over the pier and at 1/8 of the span length are mainly due to deck shrinkage. Bridges with larger skew angles have lower strains over the intermediate supports. Secondary moments affect the behavior in the negative moment region. The impact may be significant enough such that no tensile stresses in the deck may be experienced.